BENNETT, Colo. -- It's the neighborhood hangout for heroes. Unfortunately, vandals decided part of it should be destroyed. 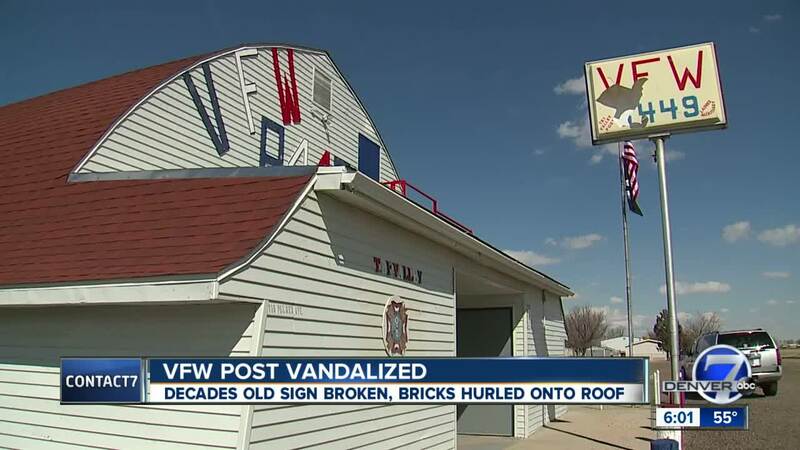 VFW Post 8449 in Bennett is now picking up the pieces after vandals destroyed a decades-old sign and caused other damage to the building this past weekend. Post 8449 has been here since just after WWI. "It's a place for the veterans to come and be around each other,” Quinn said. “We've got members that are suffering from and being treated for PTSD. Veterans help veterans — there's no doubt about it." The vandals also damaged some siding on the back of the building. “Bricks and rocks up on the roof," Quinn said. “Pieces of the sign broken." Vandals also hit the park next door, knocking over obstacles in the skate and dirt bike park. It’s not the first time they’ve hit the VFW. "Yeah, I get a little choked up about it,” Quinn said. “It bothers me as a citizen to have our community damaged by kids, young adults who don't seem to care." Post 8449 has hosted countless events over the years. Vietnam veteran Dan Goodnight serves as the chaplain here and oversees a lot of those events. "Funeral receptions and weddings," Goodnight said. "High school events. We try to do everything we can for the community." And while the recent vandalism stings, the community response is comforting. The fire department showed up to remove the broken pieces from the sign. And the support on Facebook has been overwhelming. "Almost 200 people liked that page that have never responded before," Quinn said. "We've all proudly served, and this is where we gather," Quinn said. The VFW is taking donations to fix the sign and other damage to the building.